This week I took on the large task of implementing a serialization scheme that allows saving the user’s scene onto their disk. 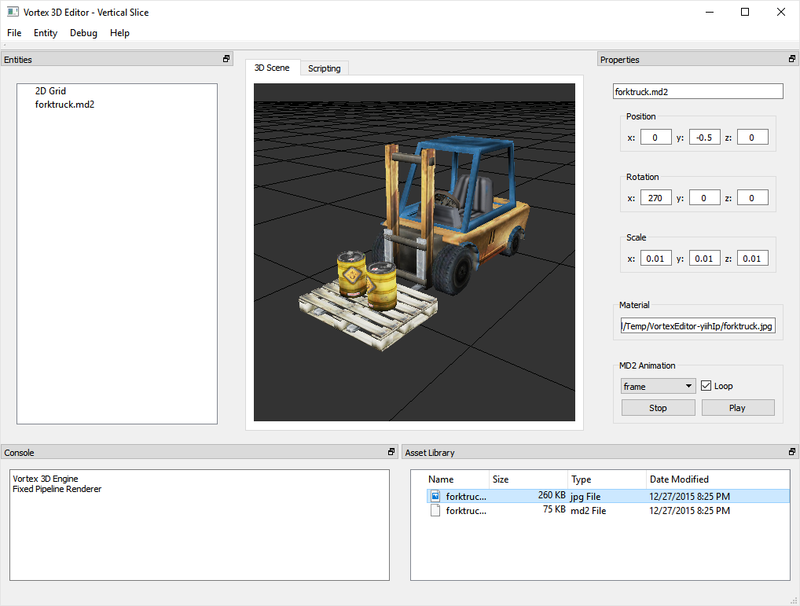 A scene containing a textured forktruck model. Serialize the scene by encoding its contents into some format. Deserialize the scene by decoding the format to recreate the original data. I’ve chosen JSON as serialization format for representing the scene’s static data. That is, entities and components, along with all their properties and relationships are to be encoded into a JSON document that can then be used to create a perfect clone of the scene. Why JSON? JSON is a well-known hierarchical file format that provides two good benefits: first, it’s easy for humans to read and hence debug. Second, it provides an uncanny 1:1 mapping to the concept of Entity and Component hierarchies. The downside is that reading and writing JSON is perhaps not as efficient as reading a custom binary format, however, I consider scene loading and saving an operation rare enough, most likely to be performed outside of the main game loop, so that it’s a feasible option at this time. OK, so without further ado, let’s take a look at what a scene might look like once serialized. The following listing presents the JSON encoding of the scene depicted above. It was generated with the new vtx::JsonEncoder class. The document begins with a list of entities. Each entity contains a name, a transform, a list of children and a list of components. Notice how the transform is a composite object on its own, containing position, rotation and scale objects. Let’s take a look at the encoded forktruck entity. We see its name has been stored, as well as its complete transform. In the future, when we decode this object, we will be able to create the entity automatically and place it exactly where it needs to be. Now, you may have noticed that components look a little thin. Component serialization is still a work in progress and, at this time, I am only storing their types. As I continue to work on this feature, components will have all their properties stored as well. On a more personal note, I don’t recall having worked with serialization/deserialization at this scale before. It’s definitely a challenge that’s already proven to be a large yet satisfying task. I am excited at the prospect of being able to save and transfer full scenes, perhaps even over the wire, and to a different device type. The plan for next week is to continue to work on developing the serialization logic and getting started with the deserialization. Once this task is complete, we will be ready to move on to the next major task: the complete overhaul of the rendering system! This week was pretty packed, but I found some time to write the final addition to the native components for the vertical slice of the Editor. This time around, the new Scale Tween Component joins the Waypoint Tween and Rotation components to provide an efficient way to animate the scale of an entity. With this new component, Vortex now supports out-of-the-box animation for all basic properties of an entity: position, rotation and scale. vtx::WaypointTweenComponent: continuously move an entity between 2 or more predefined positions in the 3D world. vtx::RotationComponent: continuously rotate an entity on its Ox, Oy or Oz axis. vtx::ScaleTweenComponent: continuously animate the scale of an entity to expand and contract. The Scale Tween Component was implemented as a native plugin that taps directly into the Core C++ API of the Vortex Engine. This will allow leveraging the speed of native, optimized C++ code for animating an entity’s scale at a very low overhead. In the future, once we have implemented scripting support, a script that desires to alter the scale will be able to just add a Scale Tween Component to the affected entity, configure the animation parameters (such as speed, scaling dimensions and animation amplitude) and rely on the Entity-Component System to perform the animation of the transformation automagically. Of course, Scale Tween components can also be added statically to entities by means of the Vortex Editor UI. Time permitting, next week we’ll finally be able to move on to entity hierarchy and component persistence. I want to roll this feature out in two phases: one where I first implement the load operation and then, once it’s been proven to be solid, I will then implement saving from the Editor UI. There’s this and much more coming soon! Stay tuned for more!